The Upper Greenwood Lake Property Owners Association (UGLPOA) is a non profit created for the purpose of beautifying the lake community. 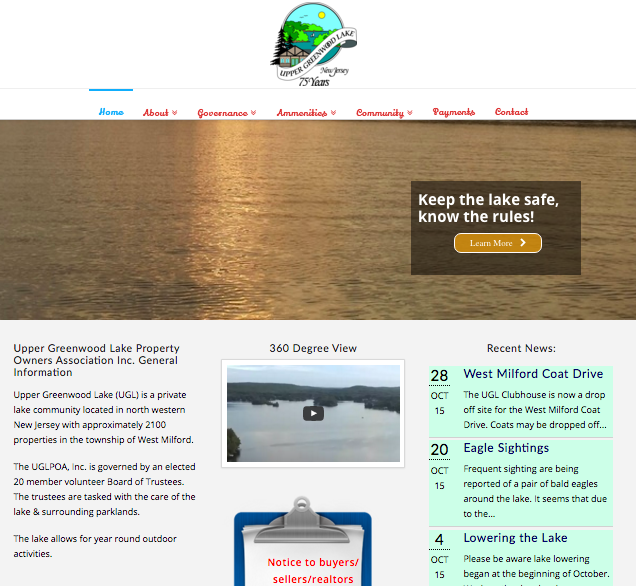 The main goal for the UGLPOA with their new site was to be able to easily update the lake community of important information. While the site needed to be an instrument of disseminating information, it also needed to be appealing to potential new owners. after years of struggling to keep information digitized using the old site we came and delivered a site capable of newsletters, important form transmission, and much more. One of the great things about the UGLPOA is the care they take to make the lake and surrounding parklands be an amazing natural habitat for wildlife. Thats why created a page to showcase the wildlife to the entire community.